One day I'm going to start using a real digital camera. However, I imagine if I'd gone and gotten my real camera, by the time I got it, loaded it with batteries, and gotten ready to take the picture, the opportunity would've been missed. Add on top of that the fact that I'm NOTORIOUS for leaving pictures on my memory card forever, so if I'd done that, it probably would've never made it this far. This is a picture from the window in my living room. 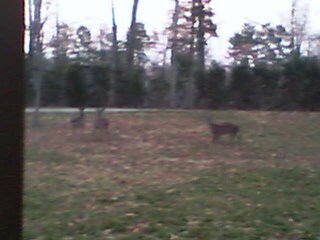 One of the reasons I was excited about moving out to the country was because I envisioned looking out my window and seeing deer in the yard. I've been in the house for 9 years this July. Apart from a brief glimpse of a deer running through our back yard once, this is the only time I've seen deer in our yard. upon God in public ordinances. Whether during persecution from Saul during his son Absalom's rebellion, David was going through a rough time. Matthew Henry says he was "cut off from the privilege of waiting upon God in public ordinance". The image of a deer "panting" for the water gives the image of need....dire need. I was watching "SurvivorMan" last night (great show, by the way), where he tried to spend a week in the canyons of Southern Utah. He talked about the 5 W's that someone can judge their odds of survival -- Weather, Widowmakers, Wigglies, Wood, and....Water. There was not a steady supply of water for him to drink, and you could tell his desperate need for it, and his fear that he wouldn't last. That's how I want my desire for God.....to be so desperate for Him that, when I'm away, I can't survive.